Dogs have long been treated to being pampered with expensive shampoos, special haircuts and nail polishing, visits to doggie spas during the day or while the master vacations, and much more. So where do we go from here? Apparently a long way. In fact, all the way to the advent of artificial testicles. For decades, many groups worldwide have advocated neutering and there is little question about its efficacy. It helps prevent the overpopulation of animals, stops the development of testicular cancer, keeps your male pet from roaming, and so much more. But to neuter or not to neuter can be a tough call to make for many pet owners. They worry about their friend gaining weight (this really doesn't have to happen), becoming lethargic (nor does this) and other issues associated with removing Max's testicles. Some simply do not like their dog's appearance after having it neutered. Others, believe it or not, worry about the dog's sense of worth, or his self-esteem, the fear being that their dog will notice that something is missing and be concerned about it. What? Self-esteem? Yep, it's true. Thus, you have the idea behind Neuticles' testicular implants for dogs. Neuticles originated in 1993 when Gregg Miller thought it would be great to replace his bloodhound Buck's neutered testicles with an artificial pair. He brought together a group of veterinarians who were interested in the replacement concept and two years and a half-million dollars later the world's first commercial dog testicular implant procedure was performed. Since then, over 500,000 pets worldwide have been "Neuticled," according to the company's website. The procedure has been performed on dogs, cats, horses, and bulls, without a single complication, according to the site. Neuticles cost $94/pair and up for something call NeuticalOriginals, $219/pair for NeuticlesNaturals and $329/pair for NeuticalsUltraPLUS. This does not include the cost for your veterinarian, who will perform the implant. The Originals are made of polypropylene, the Naturals are solid Silicone as is the UltraPLUS set except the latter pair has something called ScarRetard, which supposedly does just that. Your pet's age, weight and breed determine correct size. Oh, and if you're thinking of getting a pair for your favorite horse, the price goes to about $650/pair. Neuticles can be ordered by the pet's owner or by a vet. One final point about ordering Neuticles: Correct fitting is important so don't think you can turn your Chihuahua into a Rottweiler by simply buying him a begger set of cojones. What does the dog think about all of the fuss and expense of being neutered and then fitted with a replacement set of testicles? Probably not much, if anything. Even the most intelligent canines will not understand that a part of their anatomy has been taken away and replaced with something artificial, once the initial discomfort has passed. Will they notice when they look in the mirror or bend around to lick themselves? Probably not.. But, admittedly, we don't know a whole lot about what dogs think. There aren't many major studies underway right now that can look into a dog's mind. Two exceptions to that is one being done at Duke University's Canine Cognition Center in Durham and another using MRI scans to look into a dog's brain at Emory University in Atlanta. The Duke study has shown that dogs understand that they can rely on people for help, some dogs more so than others. The MRI study was done with unrestrained, completely awake dogs, after much training to keep the dogs from moving while in the machine. That's pretty much the extent of the study up to now, but this could be a significant breakthrough. Its success opens the door to more studies into a dog's mind and how dogs think. Look, all of us who have dogs like to believe they can think. Everyone of us can give an example of how they know this for a fact. So what's the point? 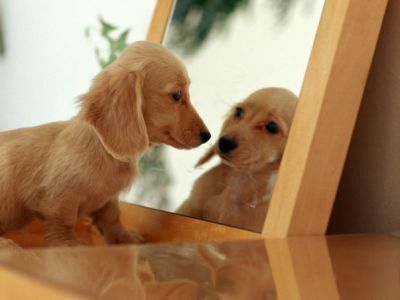 Dogs don't have a sense of self-esteem. They don't really notice that they've been neutered and sadly think "I'm only half the dog I used to be." We can only think about how dogs think in terms of how we think. The studies at Duke and Emory, especially the studies using MRI, may change that in the future. But right now, we don't know how dogs think or even if they do think. Don't be confused by punishment and reward. Here's the bottom line: Anything that causes people to think about and do something about neutering their pets and other animals probably is a good thing, certainly as far as health and other issues are concerned. But let's try to keep everything in perspective here. Neutering is done for the benefit of dogs. Replacing the neutered part with something artificial is done for the benefit of the dog's owner. So what do you think of adding back a dog's balls? Do you think it's nuts? Or do you think it's a smart, humane and loving thing to do for your dog?